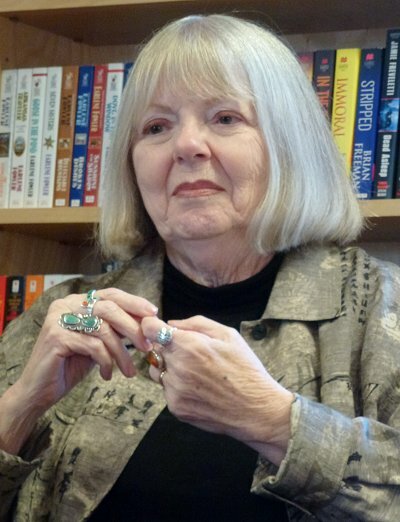 I have long been a fan of author Betty Webb. 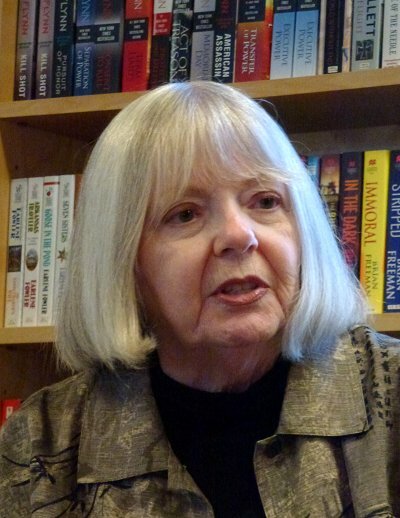 I enjoy both her series, but she's probably better known for her books featuring private detective Lena Jones (whose fictional office would be close to The Poisoned Pen in Scottsdale). Lena often deals with social or human rights issues, and although Lena does have a sense of humor, this author's second series allows her funny bone a much freer rein. The Gunn Zoo series is set on the central California coast and features zookeeper Theodora (Teddy) Bentley who lives on a boat, has a colorful set of parents, and always seems to be fighting to keep an animal out of jail. 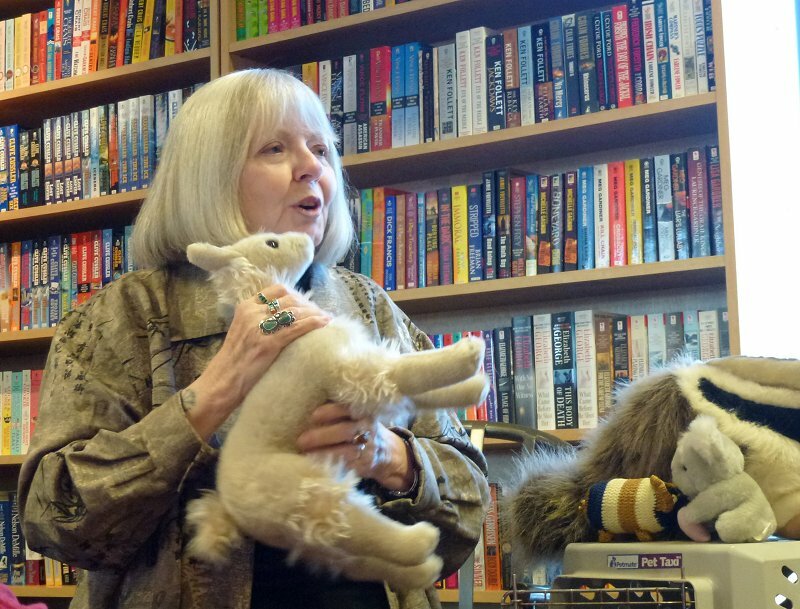 The third book, The Llama of Death is just out, and it's the reason why 80 people showed up to meet Betty. Betty arrived carrying a Pet Taxi, which made many of us crane our necks trying to peek inside. Betty smiled and carefully kept the carrier's opening turned away from inquisitive eyes. While she began passing around photos that she'd taken at the Renaissance Faire that's held every year in Apache Junction (one of the country's largest), host Barbara Peters let us know that she had some news for all of us. "Yes, there will be a Cozy Con this year at the Phoenix Public Library. It will be on Saturday, May 4, and since last year's sold out, it would be a good idea to register early!" "This is how an anteater brings down a jaguar..."
Once all the news was out of the way, Betty turned the Pet Taxi around and opened it. 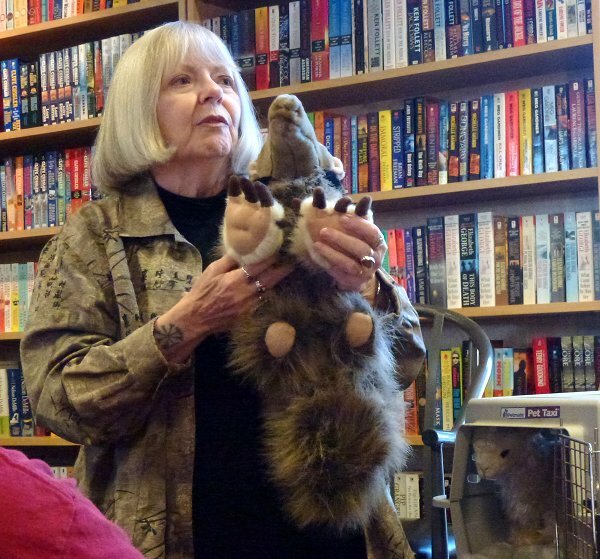 She has a collection of stuffed animals, and if you've read any of the Gunn Zoo books, you'll notice a few familiar faces. 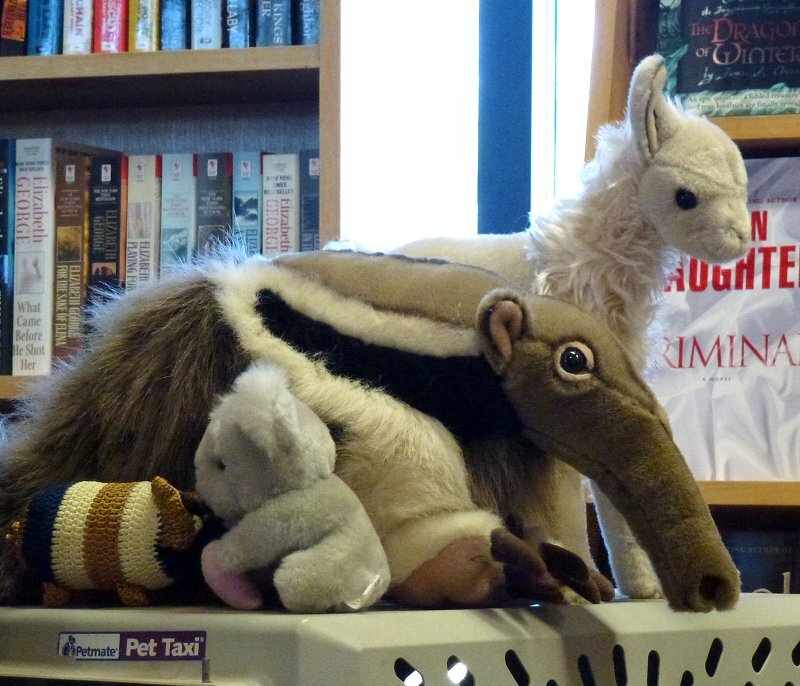 First out was Lucy, star of The Anteater of Death. Anteaters can be extremely dangerous, due in large part to the huge claws they have on their front feet. "Anteaters are the only animals in South America that can bring down a jaguar," Betty told us. She then demonstrated how that would be done, ending with, "... and bye bye, kitty!" to which someone replied, "Spoken like a true mystery writer!" which had us all laughing. Wanchu the Koala was next up in Betty's "show and tell." The koalas' diet of eucalyptus leaves means that the animals don't have a high energy level. They also have some nasty claws and aren't as cuddly as most people think. Betty got the idea for The Llama of Death when wandering around the Renaissance Faire in Apache Junction. She happened to see a thoroughly disgusted teenage girl dressed in medieval wench garb who was leading around a llama. Was the llama disgusted, too? Not at all. The llama was in heaven because a little three-year-old girl was on its back. Betty kept thinking, "Disgusted wench, happy llama," and thus the idea for The Llama of Death began to germinate. "I don't ever want any of my animals to go to jail." Betty showing how she dressed as a zoo volunteer. 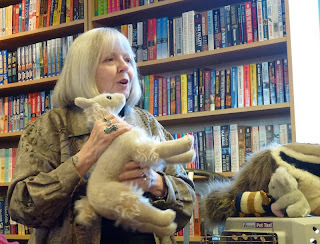 Betty told us that there's never been a report of a llama killing a human, although it would be a very painful experience to be stomped by one. 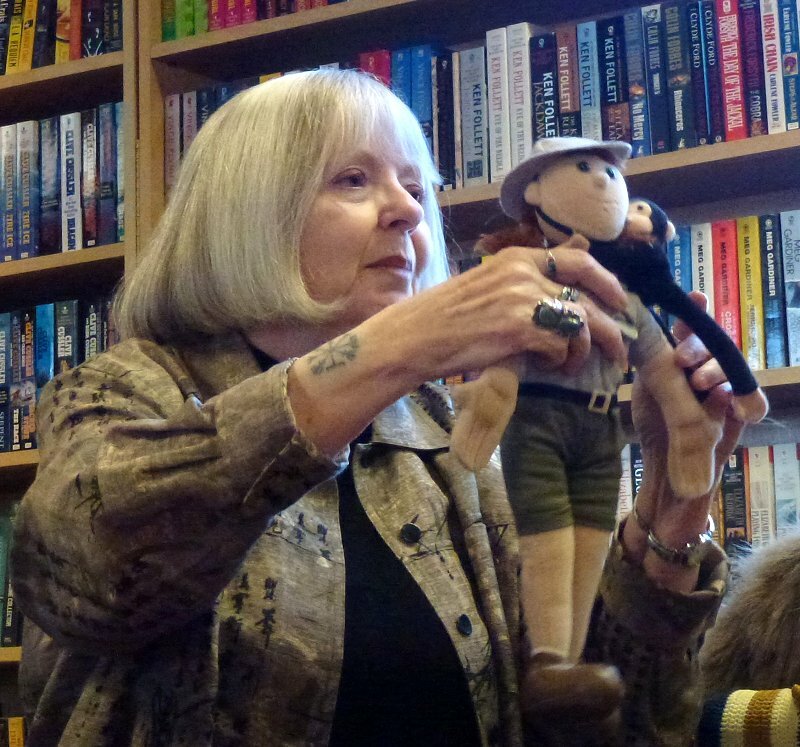 She then showed us a doll dressed in the uniform she wore as a volunteer at the Phoenix Zoo. She used to work with the monkeys and continually had to tell visitors, "Do not touch that monkey!" 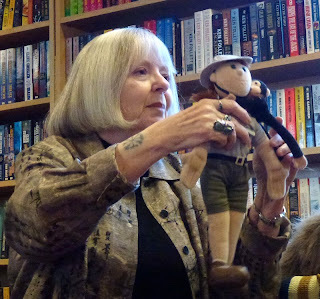 Barbara Peters gave Betty an addition to her stuffed animal collection: a small bear dressed in black and white stripes, accessorized with a ball and chain. Where did the bear come from? Alcatraz! Barbara looked at us, smiled, and said, "Little does Betty know, but this bear has a secret message." Turning it around so that we could see its back, we saw the words "Too Cute". 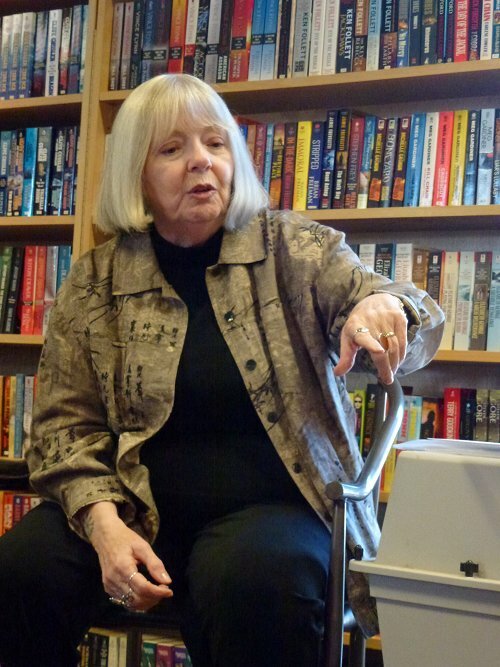 "I edit Betty's Lena Jones books," Barbara said. "They are much darker than the Gunn Zoo series. I do my editing with a red pen, and I've been known to slash through things with my red pen and write 'Too cute!'" It was a perfect gift, but I'm sure many of us are wondering if a bear will be featured in a future Gunn Zoo book. What's the next animal going to be? A puffin. Betty spent two weeks in Iceland studying puffin rookeries. I look forward to reading The Puffin of Death when it's ready! "I have mined my family tree." The character of Teddy Bentley in the Gunn Zoo books is very much like Betty Webb herself. In fact Betty told us, "I have mined my family tree." Teddy's mother is based on Betty's mother (who was married seven times), and Teddy's father is based on Betty's father (although Betty's father was not an embezzler, he was married five times). "Don't come whining to me about your stepparents," Betty says. 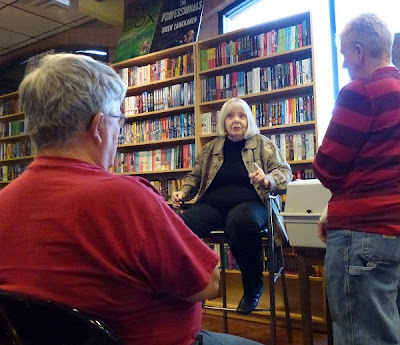 "I enjoy writing the Gunn Zoo series because it gives me a chance to get back at my family. Revenge is sweet!" Now that may make you wonder how Betty's family feels about being portrayed in these books. The only complaints Betty has gotten so far are along the lines of "Why haven't you put me in one of your books?" "I'm not milking another goat!" Betty was asked if she'd had any experience with llamas before writing The Llama of Death. She had, as a reporter for the Tribune here in the Valley. Each year during the Arizona State Fair, the newspaper's reporters were expected to participate in a goat milking competition. Betty, who was raised on a farm and can milk anything, was sick of it, so when her boss looked at her and started to speak, Betty exclaimed, "I'm not milking another goat!" Her boss's reply? "No, you're in a llama race." The petite Betty chose a petite llama, knowing that if she chose a tall one it would run right over her during the race. She and her llama did quite well working their way through the obstacle course, and they finished second... until the winners were disqualified and she was moved to first. When asked about the next Lena Jones book, Betty told us that its title is Desert Regret. She calls her Lena Jones series "mysteries with a social conscience," and said that Desert Regret is the first book in that series that's not based on a real investigation. Betty does work from an outline when she writes her books, but she believes that "if you outline too tightly, you outline the magic away." It takes six months for her to write a first draft in the Gunn Zoo series, and ten months for a first draft of a Lena Jones book. "How do you know when your book is finished?" Betty was asked. "I know the book is finished when I read the last sentence and cry," she replied. I almost could've cried when I realized our time was at an end. I could've listened to Betty Webb for several more hours. Betty Webb talking with two of her fans. Cathy - Oh, it sounds as though Betty Webb is just as delightful in person - with that great sense of humour - as in her work. So glad you got the chance to hear her! I'm very lucky to live in the same metropolitan area, so I'll be making an effort to attend any of her local appearances. What a fabulous event! I love that she had her stuffed animals in a pet carrier. I would have wondered why the animal in there was so quiet. Having read things on her social media sites, I was already in the know, so I knew why there was no movement or sound from the carrier. I loved watching the others, though! I'm glad you enjoyed it, Chris!